We were looking for a bit of cheer on a Saturday in late April. Though well into spring, winter retained its chilling grip on the East End. Months earlier, I had purchased a coupon from Travelzoo, offering a great deal for two at Vines and Hops, in Riverhead. It was time to put that deal to work, and see what Vines and Hops was pouring. You will find Vines and Hops at 127 East Main St. in Riverhead, just a few doors down from the winter/early Spring headquarters of the Riverhead Green Market. We are glad to see Main St. starting to come alive again, after a period of decline and stasis. There is street parking, and the big riverfront parking lot is just behind that row of taxpayers. Turn right in, park, and enjoy the view of the Peconic River, before visiting Vines and Hops. The owners did a beautiful job of constructing a comfortable and inviting space where you and your friends can lounge and enjoy service on couches, or sit at the slick bar on spacious bar seats. We arrived at 2:00 pm as the bar opened, and opted to sit at the bar. Our Travelzoo deal offered four glasses of wine, and two appetizer plates. Here is what we enjoyed. With the proximity of Vines and Hops to the North Fork Wine Trail, we expected to see a choice of East End wines. Instead, we were surprised and pleased to see a much wider selection, including West coast and international selections. The wine list was chosen with great care to ensure there would be no wrong choices. Not sure what to try? Ask proprietor Jeff McKay for a recommendation. Not up for wine? They offer a large selection of craft beers, so everyone in your group will find something to enjoy. Owing to the raw weather, Marian and I decided to go with red wine. We tried the 2010 Gerard Bertrand Pinot Noir, and the 2011 Alexander Valley Cabernet Sauvignon. Why choose these? We wanted to open with a delicious Pinot, and we’ve traveled the Alexander Valley and were excited to give the Cab a shot. Gerard Bertrand won the European Winery of the Year award in 2012, and this Pinot shows what they can do with a grape that can be challenging to get right. We loved its deep red fruit with strong notes of raspberry, and a hint of chocolate. The Wine Enthusiast liked it too, giving it 90 points. You can enjoy this pour for $9.00/glass or $30.00/bottle. Two of you? Get the bottle and relax on the couch. We had a great time touring in the Alexander Valley of California, and expected a great taste. We were not disappointed. With lush black fruit and perfect tannins, this wine is balanced and focused. It has great body, and was great with our appetizer plate, or the steak of your choice. At $13.00/glass, or $39.00/bottle, you will be drinking something special. 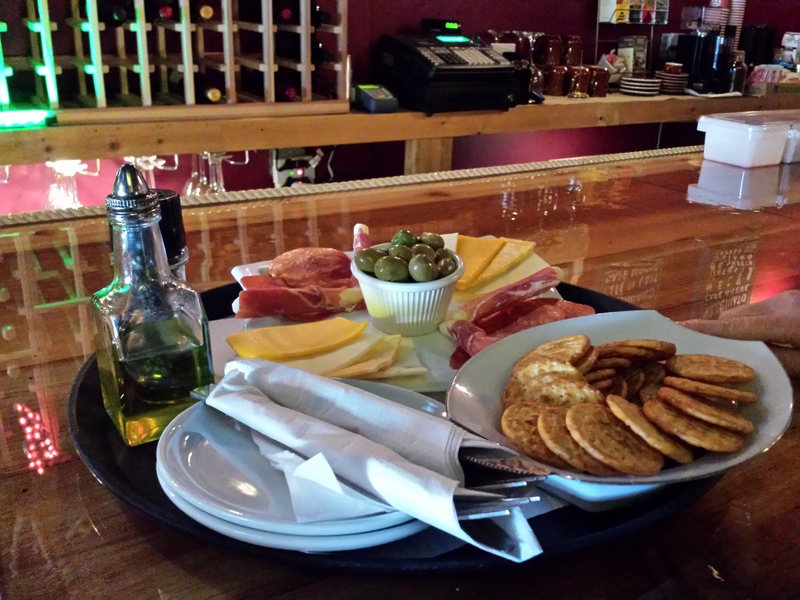 Vines and Hops had a collection of appetizers on offer, all centered around cold cuts, olives, cheese, and crackers. Solid snacks for a group, especially when individual choices of wine and/or beer may vary considerably. Jeff brought us out a beautiful platter that we enjoyed with both the Pinot and the Cab. We enjoyed our plates, pictured here, and lightened up on dinner later. Super wine choices by the glass or by the bottle, and good accompaniments. The couches will attract you and your friends. Jeff assured us that “couch service” is popular, and we can understand why. Looking for nice digs for an evening of drinking great wines with friends, in a comfortable atmosphere? Vines and Hops is just the ticket. Try it. We visit Lieb Cellar’s Oregon Road site on Mother’s Day. drink some good wine and meet some interesting people and dogs. Meanwhile, enjoy your trip around town.